During the spring, Rimaster has begun delivering complex electrical cabinets for installation in Atlas Copco’s surface drill rig FlexiRoc D65. Patrik Andwester, Global Key Account Manager at Rimaster Electrosystem, and Therese Hallberg, Commodity Manager for Strategic Purchasing at Atlas Copco, report on the cooperation. –“We have been cooperating with Atlas Copco since 2004 in the same way we are cooperating with them today. Atlas Copco is a large, global company with different divisions, and we are cooperating with all the divisions in Örebro on everything from new development to spare parts. Over the years we have delivered cables, boxes, panels, electrical cabinets and cabs to Atlas Copco’s various divisions, which shows how broad our cooperation is. Atlas Copco SED, Surface and Exploration Drilling, is the division we have been working with the longest. – Our cooperation began with small-scale supplies of simple cable harnesses, but has now expanded to include high-end products such as the electrical cabinets for the FlexiRoc. Our business relationship has grown in response to challenges concerning technology and the relationship, and we have both evolved as a result. 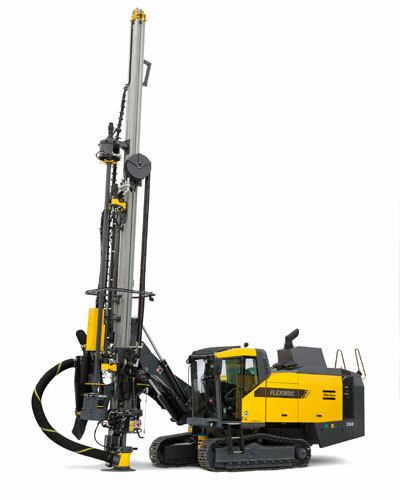 – Currently, there is stiff competition in the market for drilling equipment, and we are continually looking at how we can discover and develop better products at lower prices. At the beginning of last year we saw an opportunity to develop the electrical cabinet that is fitted in our large surface drill rig FlexiRoc D65, which is used in mining to drill holes for explosives. As a strategic buyer of electrical components, cable harnesses and electrical cabinets in our surface drilling division, I am the person with commercial responsibility towards our suppliers. We invited tenders for production from different suppliers and Rimaster, which has been an important supplier for us for a long time, was of course also invited to tender. There are several reasons why the contract was ultimately awarded to Rimaster. We considered their expertise, their ability to integrate complete solutions, how skilled and perceptive they are when it comes to implementing improvements in their own processes, as well as their product quality assurance process. Together with an attractive price, this made Rimaster the best supplier from an overall perspective.